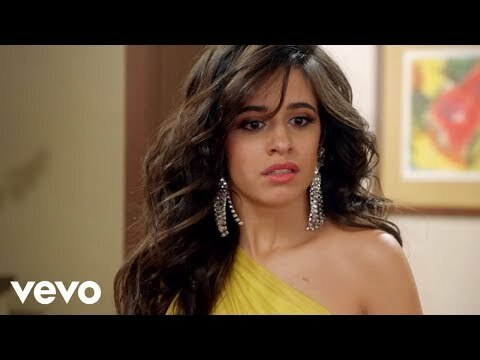 The music video starts with Karla, played by Cabello, watching a telenovela, before being interrupted by her grandmother, who turns off the TV and advises her to live her life instead of spending her days indoors. Karla then leaves the house to go see a movie. The film she is watching, called Camila in Havana, takes the form of a music video, starring a version of herself wearing a fringe-covered red dress and performing at a club. Aside from appearing as Karla, Cabello also plays the telenovela actress and the movie protagonist. After the film ends, she leaves the cinema and stumbles across a cyclist, also the male protagonist of the film, and begins dancing with him. As of July 2018, the video has received 650 million views on YouTube, while there is an audio-only version with over 1.2 billion views on YouTube. It received four nominations at the 2018 MTV Video Music Awards, for Video of the Year, Song of the Year, Best Pop Video, and Best Choreography. A vertical video, directed by Sam Lecca, was released on November 10, 2017, on her official Vevo account. The clip shows Cabello and dancers on a New York City subway. The video was previously a Spotify exclusive.